we do move too fast. so we don't feel so guilty. and invite you to share your discoveries. beauty that is always there, we're just too busy to notice. and our Souls are refreshed and renewed. I loved the discussion that ensued. a gift that brings comfort, joy and peace. as I allow myself to slow down long enough to discover. in my garden that I wasn't fully aware of. that I thought only on occasional visited our gardens. live in the trees above this garden. 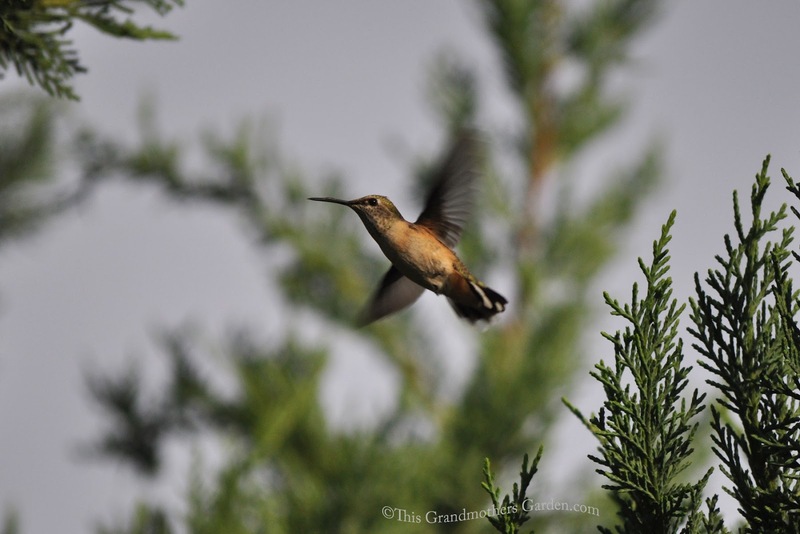 I've watched as they fly in and out of the graceful evergreen branches. as they sip refreshment from the dew. I was just too busy to notice. they call my gardens home. Here, in my gardens they rest. of feeding on the sweet nectar of the the blue Salvia. to the blue of these Salvia blossoms? and reds and the orange. 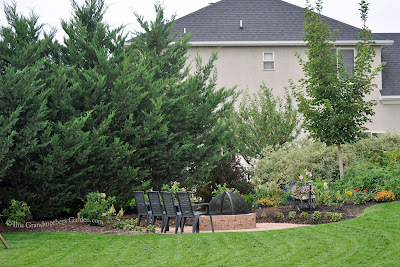 Come take the "Walk in the Gardens" Challenge. of what you discover during your walk. On the first day of each month we do this again! I so enjoyed my slow walk through your garden, the birds, the blues, the lovilies. Very nice captures Carolyn. 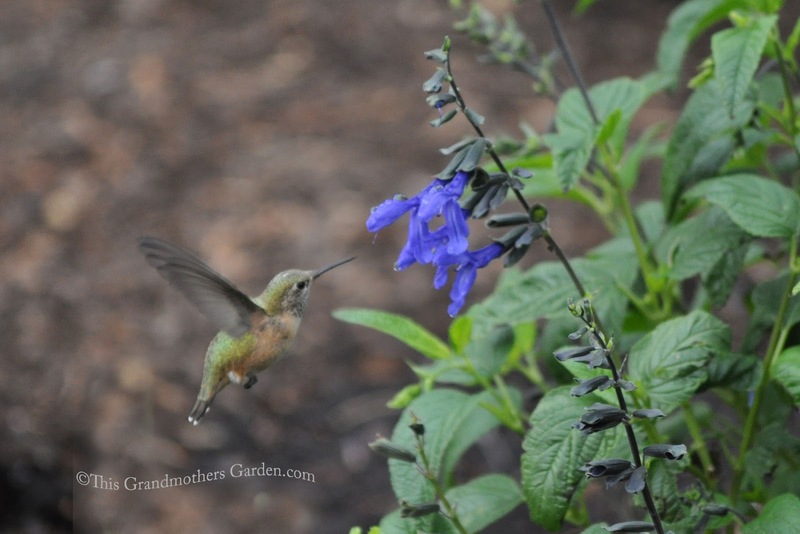 You are very fortunate to have so many hummingbirds living right in your garden. Like some of your other comments, I have seen an increase in their numbers also. I hope to find a study on this because it really is unusual this year. You had to have quick feet to follow them from plant to plant. Black and Blue was never a plant they frequented here, even though I grow quite a bit of it. If you do find a study... please share! 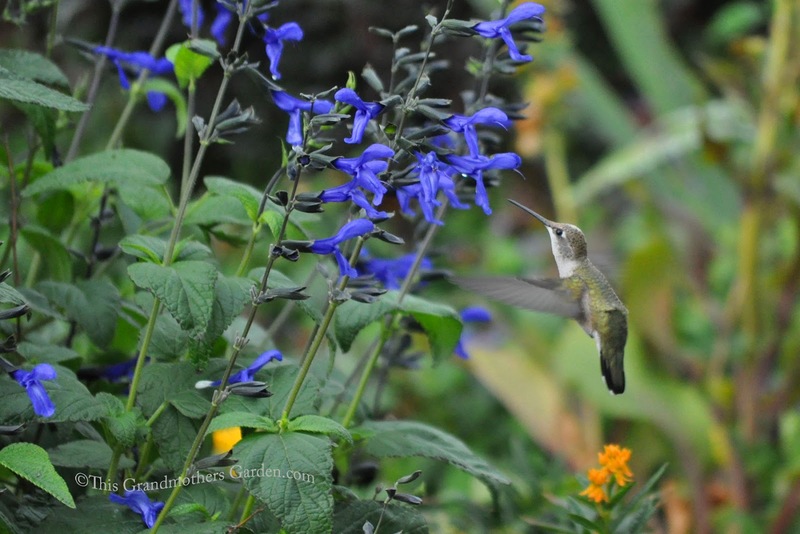 Oooh, what beautiful humming birds, how lovely to have them in your garden, the pictures are amazing! The most exotic things we get are wood peckers and mobs of house sparrows - very playful birds and amusing to watch too. 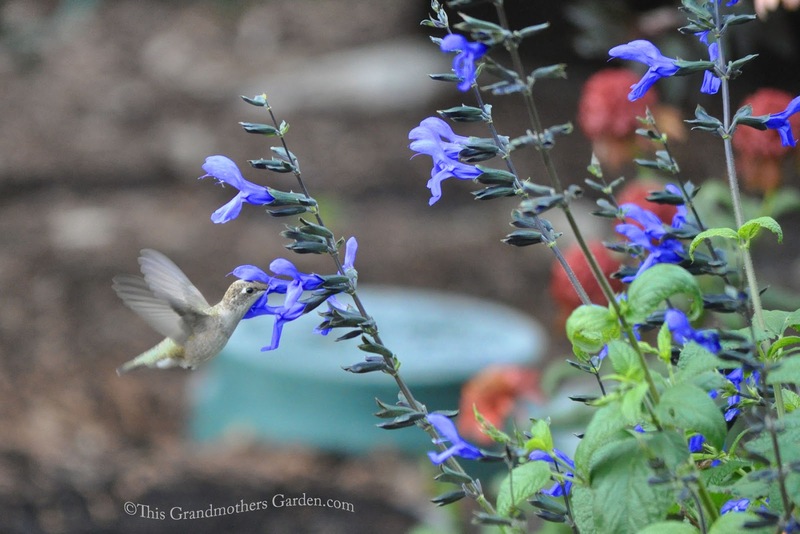 How very special to have Humming birds in your garden. 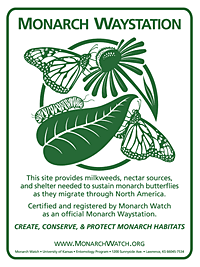 These beautiful little birds are unfortunately not visitors to the UK although there is this large moth which is occasionally seen and from a distance is at times mistaken for a Hummingbird. I did enjoy your pictures of them. Your photography is always AMAZING! 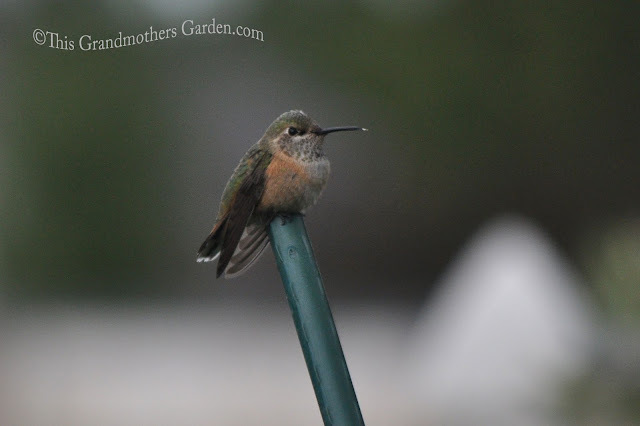 A couple of weeks ago a hummingbird overshot the feeder and got in the house. It kept flying too high to find the door out. I had to catch it in my hands. Scared me 1/2 to death that I would hurt it. It was amazing to hold that little thing in my hand. Now THAT is amazing, Elizabeth. So glad you could be the rescuer. Thanks for sharing such a sweet story. I see hummingbirds every morning on my Salvia Black and Blue! 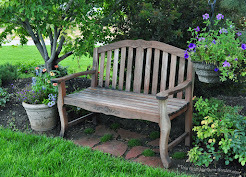 I have it planted in pots, but next year I plant to integrate it into my beds. I hope to plant more, too! Quite honestly, I found this plant in a nursery mid-Summer and planted it simply because I love blue flowers... and because it was labeled a perennial. I've since discovered that it is really an annual. Maybe if the Winter is mild it will come back. It is wonderful to discover something we have not noticed before. 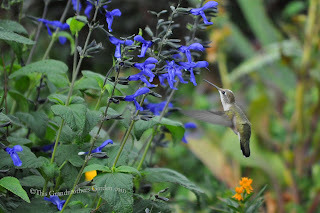 Hummers are a special visitor here too as I have many plants they love and they seem to hit every color including white. I love to watch them perch and rest. You have made them so happy in your new garden...thanks for sharing this special story Carolyn! Thank you, Donna. 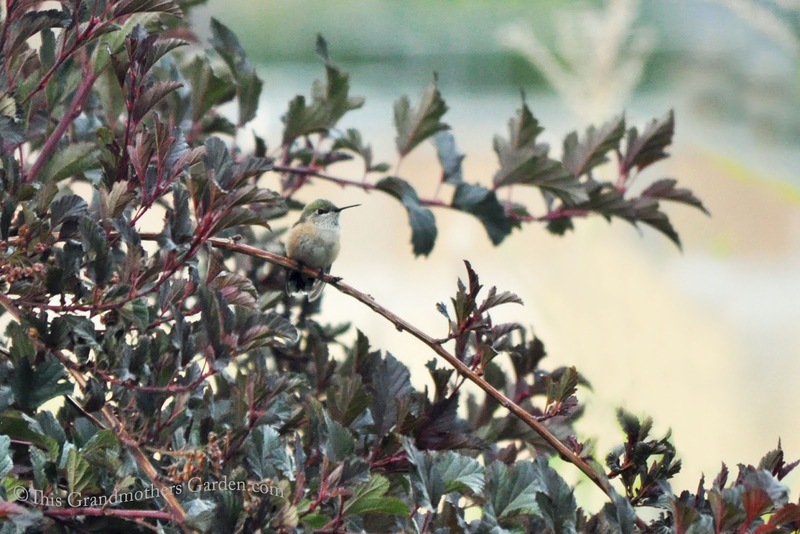 I've seen so many hummers in my garden during the past several years... that I've often wondered if they were nesting here. I've spent enough time in this particular garden in the past three weeks that I'm quite certain they are. I'm having such fun with them. 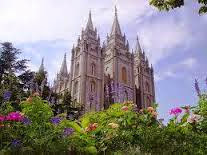 The ruby throats are the only kind we have in the midwest. I've never seen a hummingbird with a ruby throat here. What great captures! I've noticed quite a few hummingbirds for the first time in my garden this year, which has been so much fun. 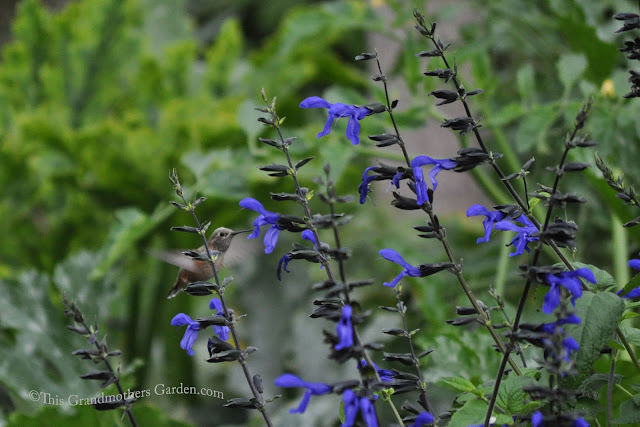 They also love my black and blue salvia! 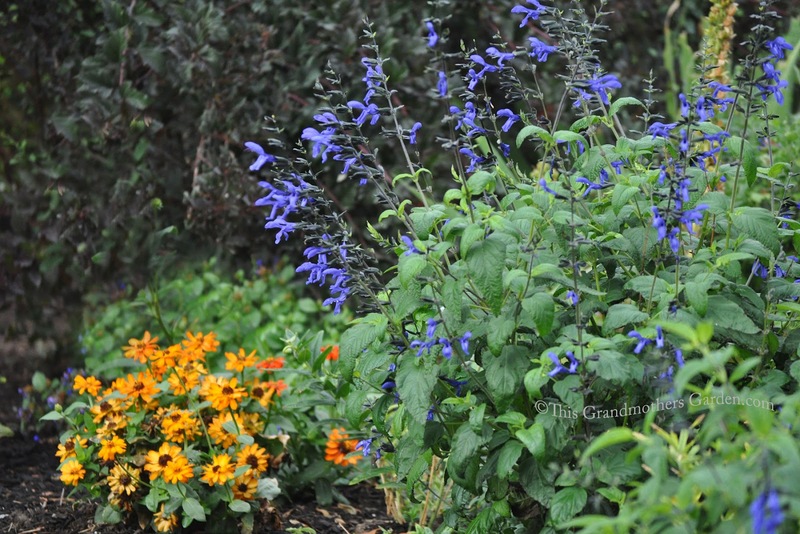 This is my first time to plant Black and Blue Salvia... sadly, it's an annual here. It's now on my list of "must haves". I think it's so important to remember that our gardens are genuine homes to so many creatures, as well as being somewhere that thousand others pass through. We need to remember this - and take care of them. Those hummingbird pictures are terrific. 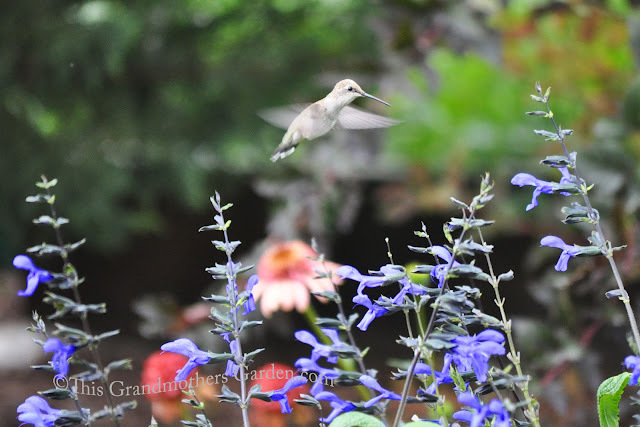 We've had more ruby throated hummingbirds than usual, but never have the camera at the right time. I would like to be able to do that Carolyn, but my walk would only take five minutes, and then Ben my Border Collie would drive all the birds away. I would leave the collie home once in a while. It would be worth it.